Five goals by the unstoppable Dylan Henshall propelled Foxhall to a 9-0 victory over FC Rangers Blues and a place in the Under-14 Hogan Cup final. The star striker followed his first-half hat-trick with two more as Foxhall overwhelmed Rangers at Squires Gate to seal their spot in the showpiece finals day at AFC Fylde. 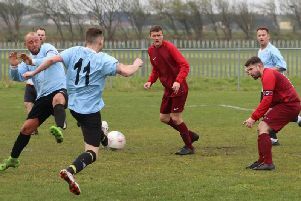 The teams have beaten each other during this Blackpool and District League Under-14 campaign, so a close semi-final was expected on Sunday morning. Rangers held Foxhall for the opening 15 minutes but after Henshall broke the deadlock Steve Shorrocks’ side were irresistible. Three up at half-time, their play was even better in the second half, when outstanding midfielder Jake Marshall scored a five-minute hat-trick and Kaiden Shorrocks was the other scorer. Several of the goals followed quick, pinpoint passing which delighted the Foxhall boss. The winners will face Poulton or Squires Gate in the final but will first concentrate on completing their league campaign. Boss Shorrocks said: “We have three to play and it looks like we’ll be second. After finishing third last year, we’ll take that and look forward to our big day at AFC Fylde. “It was an unbelievable win against a very good Rangers team. It was a nice, big pitch and we played some breathtaking football. Rangers face Poulton tomorrow in the first of four remaining league games and take heart from their debut season in an 11-a-side competition. Manager Richard Cookney said: “We lost six players to academies and other clubs, so this season has been about rebuilding and finishing fourth will be a good effort. All-action central midfielder Marshall was the Foxhall man of the match, always tracking back when he wasn’t getting forward so effectively for his quickfire treble. Centre-half Nat Gilli-Ross got the Rangers vote for a non-stop performance in which he battled bravely throughout.